Rare black Bakelite/ivory Plaskon. Cabinet is just about perfect. No cracks chips or hairlines. Radio recapped and plays. Valued at $400 in Stein's Plastic Radios book. 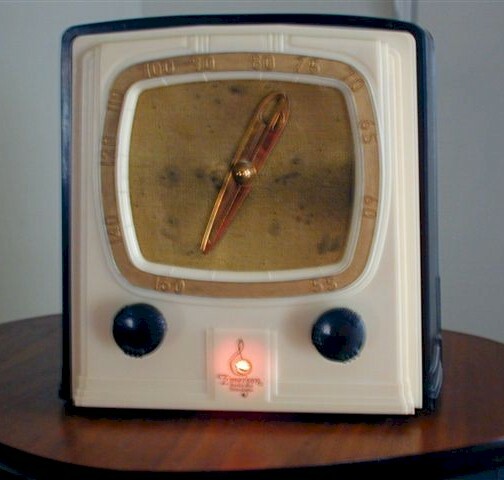 I have seen the brown Bakelite model before but this is the only Plaskon/Bakelite one I have seen! Metal grille would look good repainted gold but it does not look nearly as bad picture shows. Nice radio. Price includes shipping to the contiguous US states. You are visitor number 3,504 to this page.